Hundreds of people have marched through Bristol in memory of a teenager killed in a hit-and-run collision in the city. Troy Atkinson, 15, died after being struck by a black Mercedes near Cabot Circus at 1900 BST on Tuesday 28 April. His friends organised the event, which began in Penn Street where he was hit and ended at Troy's home in Hartcliffe. The march was held to raise funds to help his family pay for his funeral. A 28-year-old man has been arrested in connection with the incident. Speaking before the march Sarah Veale who organised the event said: "We're expecting about 500 people. 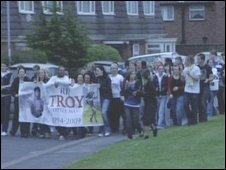 "Already there's about 200 here which is a mark of respect of how many people did actually know Troy and like him. "We all paid £5 each so that should be about £800 going to his parents."